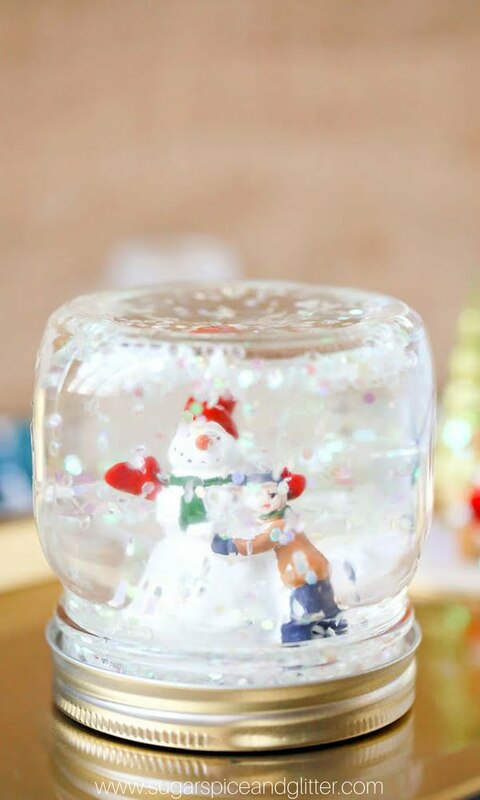 Never let go of a marvelous winter DIY project, much like this fantastic snow globe! This particular concept is everything a snow globe should be –refreshing, vivid and endearing to have at home! What you’ll need for this project is a set of toy figures – arctic animals, Mason jars, plastic greens, pebbles, Pickling salt, cardboard and some glue. Initially, glue your animals on small cardboard pieces and fit them in the Mason jar, along with the greenery. Next come the salt and pebbles, representing an idyllic winter scene! There you have it! A few simple elements, but one significant impact! Heading out for winter break? If not, here is a DIY project bound to take you places! 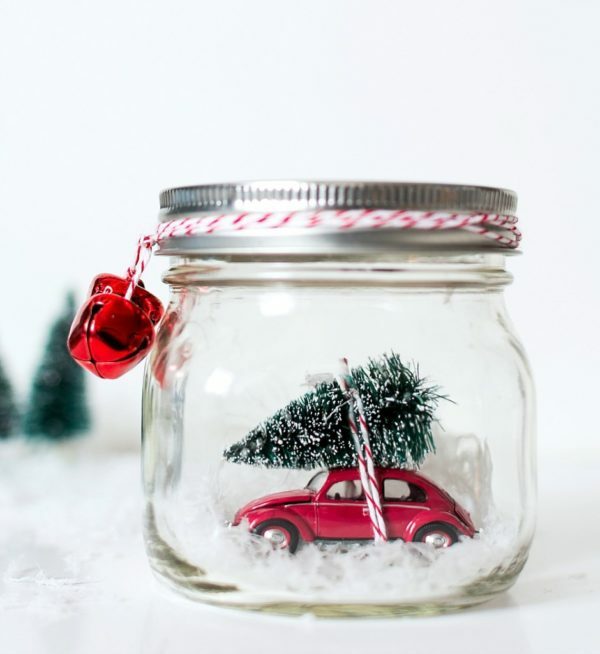 This perfect snow globe idea will get your traveling spirit up in no time. Made with a few simple bits, such as a mason jar, a toy car (a fancy one, please! ), bottle brush trees, faux snow, and jingle bells! First, attach your tree toy onto the car, using a twine. 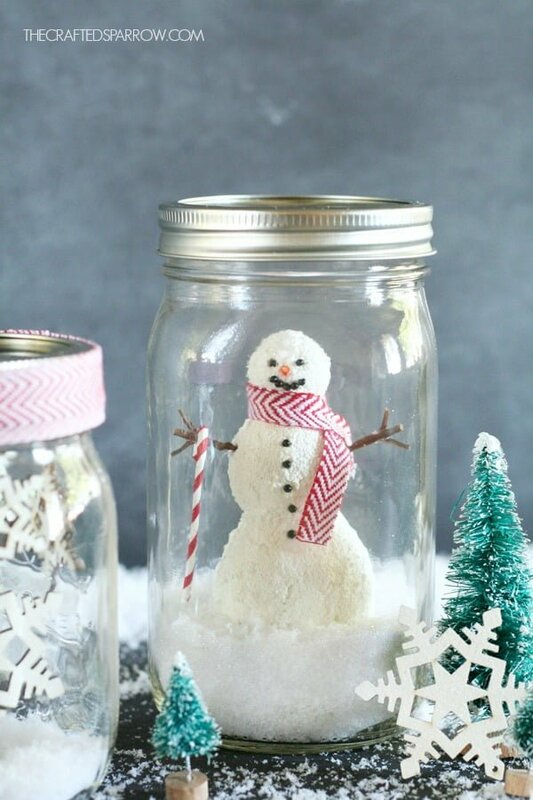 Add faux snow into your jar and begin assembling the pieces together. Also, make sure you pick a toy car sized to fit through the jar opening. Finally, seal the deal with a little jingle bell cheer! Christmas is always just around the corner, don’t you think? And, what better to start the holiday cheer early on, than with a custom-made and fabulous holiday-inspired snow globe?! Unlike others, this specific idea takes a fishbowl shape, and still delivers a traditional feel! To do it, you’ll need a few elements, like LED Mini Lights, mini holiday decorations, a fishbowl, some salt and a circular wood stand. Create a nest of LED lights and set the fishbowl on your wood stand base. Pour the salt inside and add sparkling elements to the setting. Fantastic job, you did it! The magic of Disney characters never gets old! Add a Christmas feel to the equation and you have yourself a great DIY project ahead! For this project, you’ll need a few supplies, like a Disney character figurine (we chose Olaf, and everyone are crazy for him! ), a plastic snow globe, mini tree toys, glitter snowflakes, and any other form of glitter you can find! Setting up your snow globe is easy, and detailed in the tutorial. The basic point is assembling your elements to represent the perfect ‘Frozen’ scene, and gluing everything together well! Happy holidays! Awake the child within you, and let’s recreate this spectacular winter-inspired DIY snow globe! Aside from a Mason jar, you will need the typical winter wonderland staples – a snowman, Christmas trees, sparkling snow and, of course, a sled! To hold your figurines, use plain cotton pads and glue your toys on them. Sprinkle faux snow inside the jar, filling it up just a tad. Place everything inside the jar, and enjoy your fabulous, new snow globe! Easy to make, creative and definitely within anyone’s budget, this DIY project screams for attention and deserves it! ‘Tis the season to be jolly! 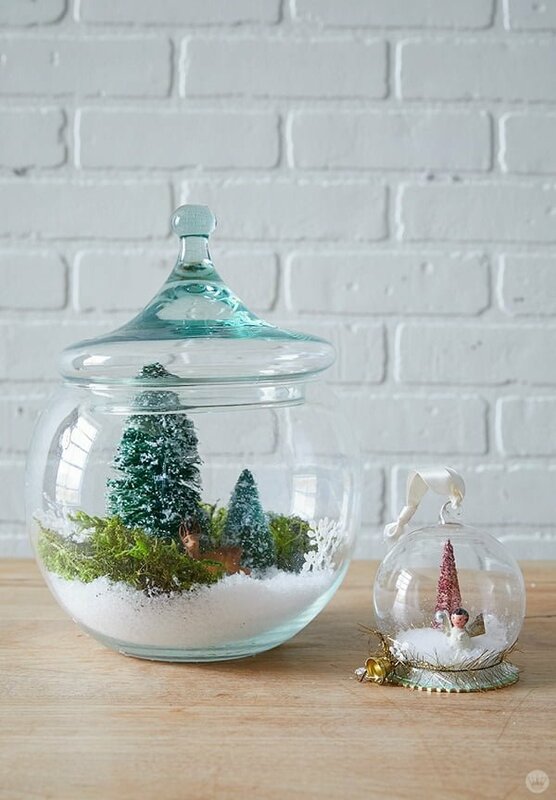 Nothing can put you in a better mood than this extra-cheeky and fun DIY snow globe idea. While seemingly complex, this concept is very easy to do, so let’s get started. The elements needed for this project include Mason jars, Christmas trees, a handful of faux snow and some waterproof glue and a piece of thick wood to serve as your base. What you need to do is glue all decorations on your piece of wood. Next, add the Mason jar, with its open top glued to the base as well! Pretty, right? One can never get too tired of Mason jars, especially when fun DIY projects are at stake! 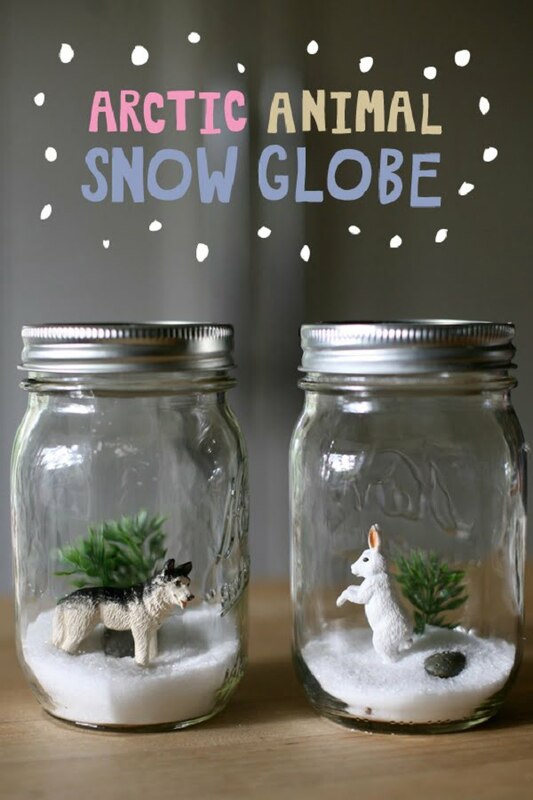 Here is another excellent Mason jar idea, transformed into a cool snow globe! For this task, you’ll need a few wide-top jars, styrofoam balls, faux snow, snow glitter, bamboo skewers, and glue. With the Styrofoam, create a bunch of Christmas pieces, like a snowman or Christmas stars. 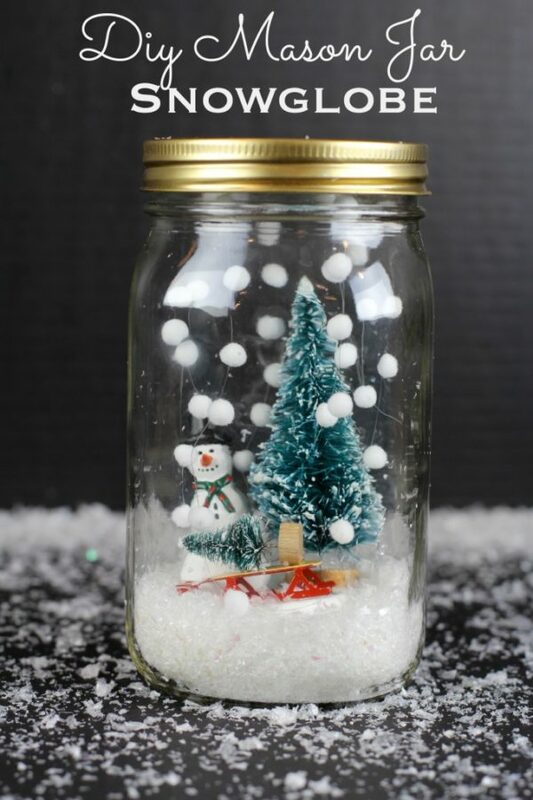 Glue all decorations inside the jar and fill it up with faux snow! Don’t forget; a little glitter goes a long way! Experiment with your ideas, and let your imagination run wild and create greatness! Snow globes make the perfect holiday gift, so here is a whimsical DIY project you can take on over the weekend! The project is simple and affordable, but certainly adds charm to your holiday setting! You will need a few supplies to recreate this idea, including a bubbled plastic cup, a model Christmas tree, a wood plaque (a knob would do as well! ), red paint and plastic Christmas toys of your choosing. Paint your wood base red, along with your knob. Glue your decorative bits onto the wooden surface and finally, secure your plastic up to the piece as well! Well done! 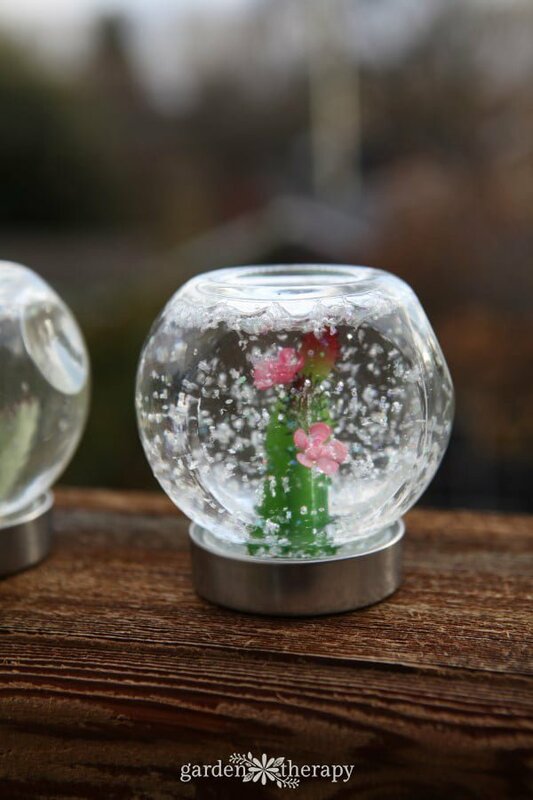 Want to get extra creative with your new DIY snow globe project? Then, this is an idea you cannot miss! 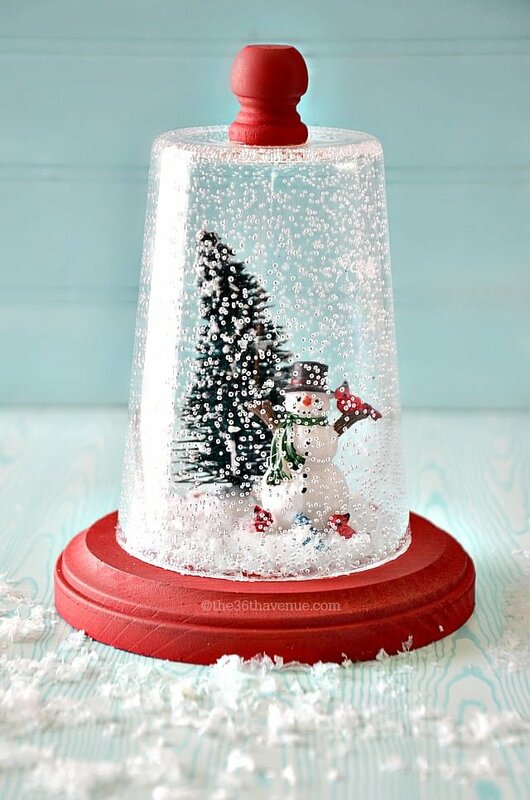 Charming and detailed, this unique and fantastic snow globe concept is easy to make and affordable as well! As for the bits and pieces, you will need Christmas figurines, distilled water, glycerine, a Mason jar, and some hot glue. And, let’s not forget the glitter, please! Turn your jar upside-down, attaching your ornaments onto the cap. Use 3/4 cup of water, 3 teaspoons glycerin and 2 teaspoons glitter for your gel-like setting. Seal the jar well, flip it over and you’re done! 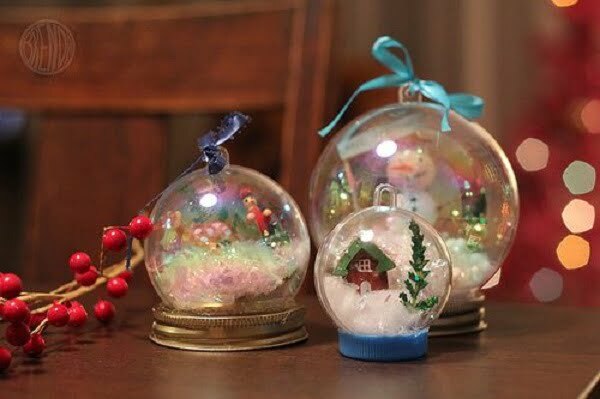 Want to make a memorable snow globe, that’s both pretty and easy to do? In that case, have a look at this next brilliant DIY idea! Now, you can make everlasting memories, framed in a beautiful snow globe setting of your taste! The supplies you’ll need for this project include printed photos of your family, a glycerine-water mix to create the gel, sparkles and faux snow to make it extra special! The tutorial is not at all complicated, and lets you experiment with both texture and color! Bright, loving and endearing, this snow globe idea is undoubtedly one of our favorites! 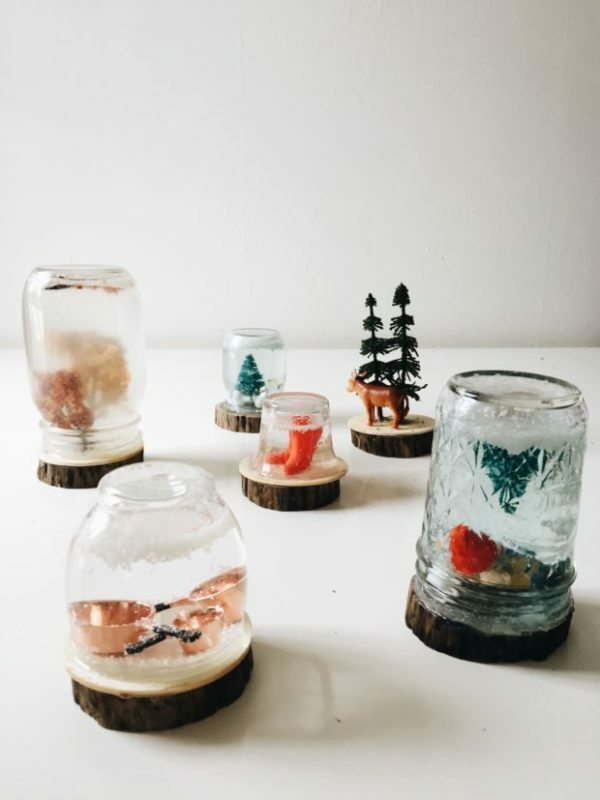 There is plenty of creativity in snow globes, and here is a variety of ideas you can use! As you can see, this DIY project doesn’t particularly stick to the traditional, holiday route. 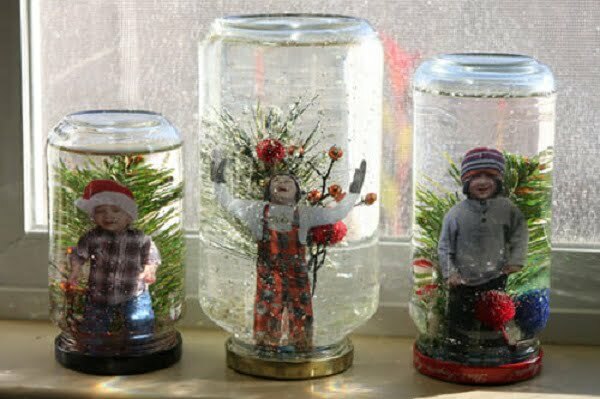 So, to make your snow globes dynamic, you’ll need a handful of figurines (not necessarily holiday-inspired), Mason jars, water glasses, glycerine and some wood pieces as your base. Without using a lid, glue all your elements on the wood surface. Next, fill up all jars and glasses with your glycerine-water mix. Add glitter and attach your snow globes to the wood surface (top-down). It looks amazing! 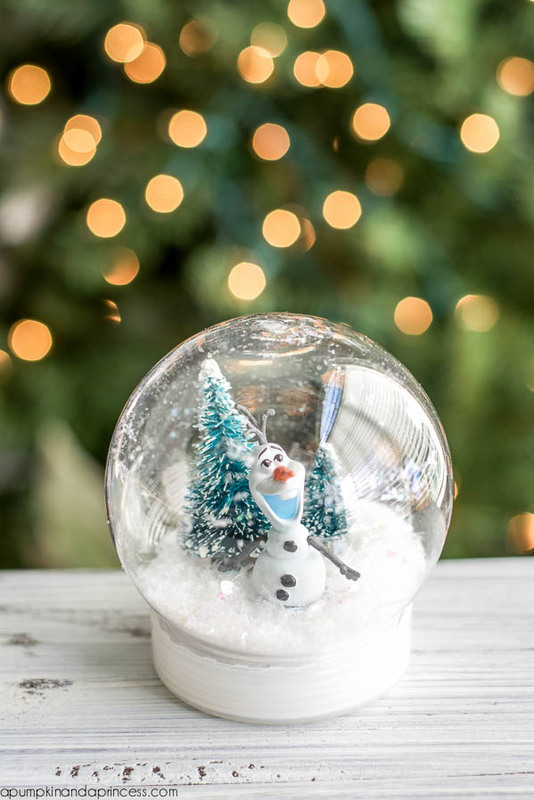 Get your family excited about the holidays, and create this incredible snow globe idea! Suitable for children to make as well, these magnificent snow globes are very simple to do. But, let’s discuss supplies. For this concept, you will need clear plastic ornaments (which can be opened), faux snow and glitter, cotton balls, figurines, white glue, cardboard, and a ribbon. Divide your cups in half, using cardboard and lids as your base. Glue your figurines well, and add glitter to your globe. Once done, seal your plastic cup and lay out your new snow globes for everyone to see! No-water winter globes do exist, guys! 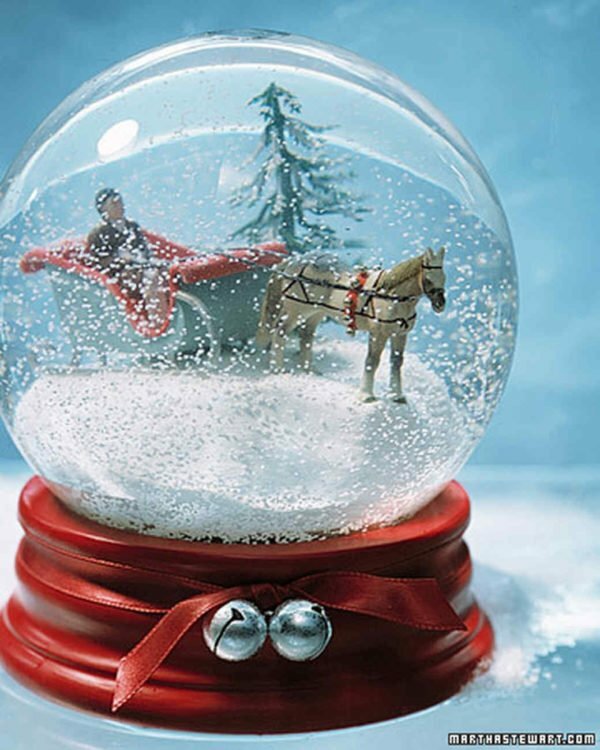 Proving just that is this precious snow globe idea waiting to happen! This is where you can use your creativity in a way that will work for your free time and of course, your budget. As for the supplies, you’ll need glass containers (jars, glasses, etc. ), Christmas-inspired figurines, faux snow, glitter, cardboard, some glue and some will to do it all! The main concept is gluing all figurines on your cardboard base, and then carefully placing them inside the jar. A bit of glitter here and there, and there you have it…all done and looking festive! Snow globes don’t always revolve around the holiday cheer! This next project is a great way to think outside the box, but still, complete a wonderful snow globe idea in the shape of a mini aquarium. To do this right, you will need a handful of supplies. 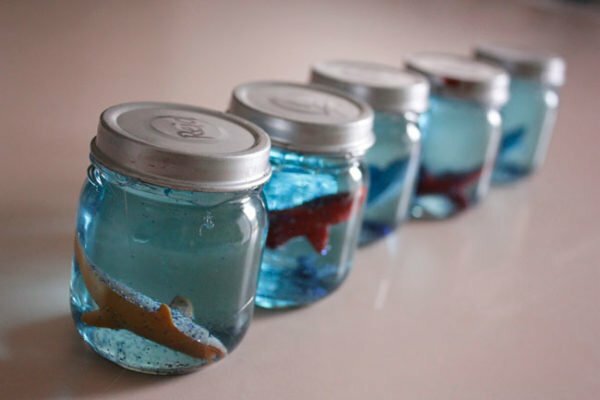 This includes baby food jars, water and glycerine, glitter and under-the-sea figurines, such as fish or algae. With no particular skills involved in the process, you’ll need to create your glycerine water gel and add blue sprinkles to it, for the best underwater effect. Keep things fun, be creative, make magic in return! If you enjoy the holiday magic, here is an excellent and rustic snow globe idea you can try at home. The bits and pieces for this project include a water globe with a base, modeling clay, snowflakes, horse and sleigh figurines, some paint, a twine, and a few others. As this snow globe takes a more traditional shape, some drilling will be involved in the making process as well. However, the tutorial is reasonably detailed, allowing you to deliver a lovely snow globe with a minimal budget and a few hours of work at hand. Without any further ado, let’s create and bring Christmas closer to home! Craving a bit of snow? 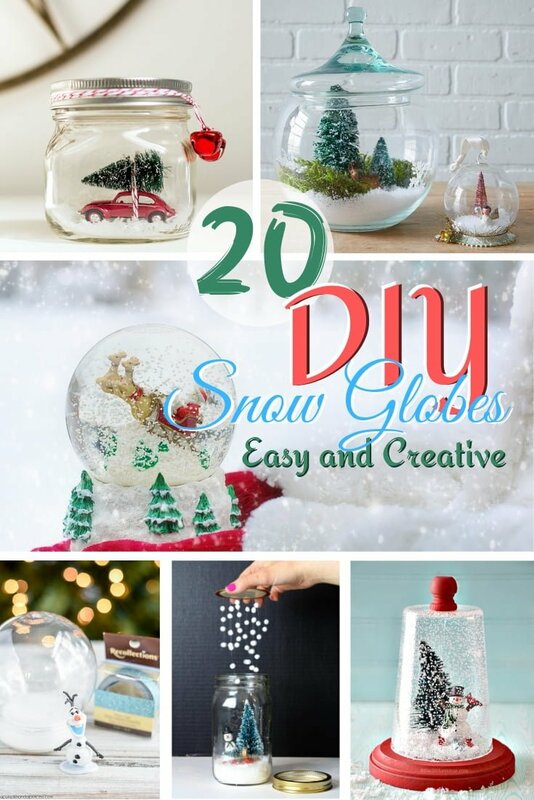 Well, look at this fantastic DIY snow globe that will get your creativity booming! 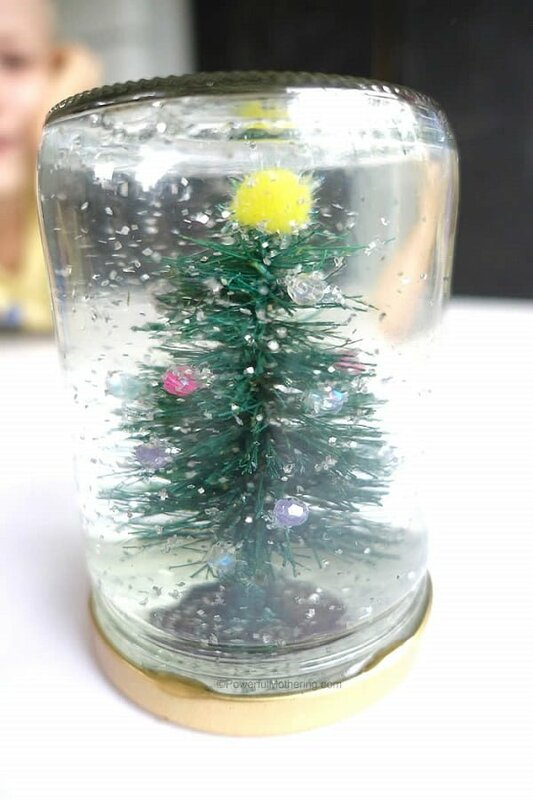 To make it, you’ll need a glass jar or a similar container, a Christmas tree model toy, glue, some glitter, and a water-glycerine mix to create the gel. To decorate your tree toy, use the glue and create small ornaments, directly glued to the tree branches. Fill the jar up with proper parts of water and glycerine. Glue your tree onto the jar’s lid, and seal the jar well. 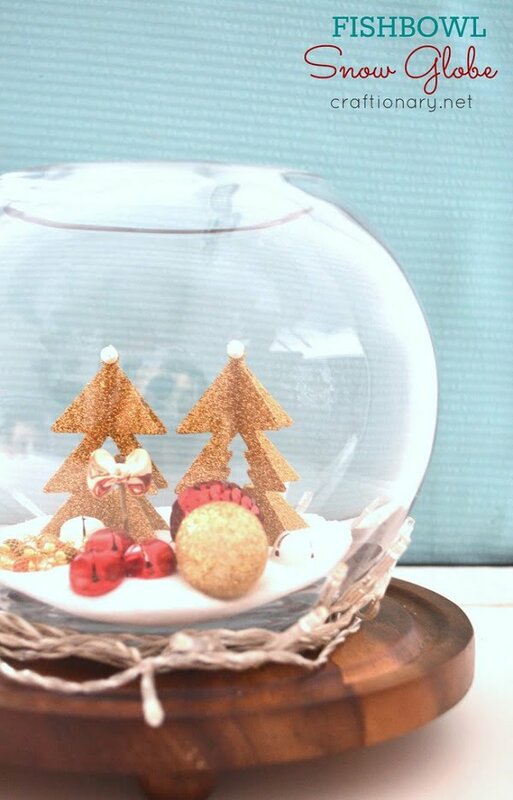 Practical, yet cheerful, this DIY snow globe is a must-do ahead of the holidays! Give your crafting skills the chance to evolve, and recreate this joyful and sweet snow globe! The winter wonderland snow theme is just a pleasure to create. 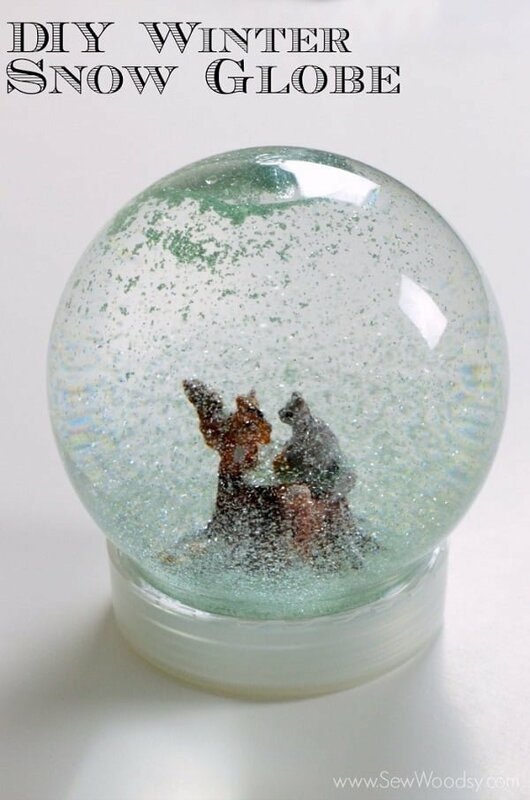 Making it will require a few essentials, like an empty snow globe, a figurine of your choosing (we obviously like squirrels! ), faux snow, a bit of glitter and a mix of water and glycerine for the insides. Initially, glue your figurine on the globe’s base. Get creative with your glitter and add it to the scenery. Next, mix water and glycerine into the globe, thus creating a gel-like consistency. Seal well, and there you go – you did it! 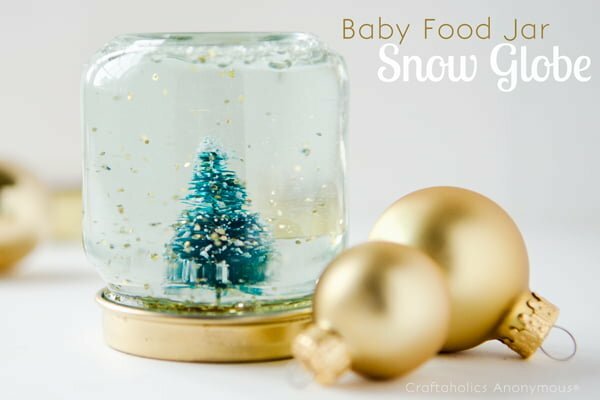 Next time you come across an empty baby food jar, why not make a snow globe from it? To help you with it, is our next DIY project, delivering the holidays at your doorstep! Managing this project is easier than it seems. All you need for it, regarding supplies, includes baby food jars, tree toys, glycerine, glue, gold spray paint, and distilled water. The drill is simple. Spray the lid in gold and glue the secured figure on it. Meanwhile, fill your jar with water and glycerine and of course, add some glitter! Secure the lid next, flip your jar and let’s hear it for your new snow globe! The perfect winter ornament is lurking just around the corner, and now you can make it, too! This perfect idea will undoubtedly introduce charm and holiday spirit into your home, and it is also straightforward to do. For this task, you will need several essential elements, like spice jars, faux mini plants, a wine cork, a nail, glue, glycerine, and glitter. First, ‘plant’ all florals in their cork. Next, glue them on the jar lid and start making your gel. Once the consistency is set and perfect, stick the pieces together and exhibit these precious mini snow globes anywhere in your home! 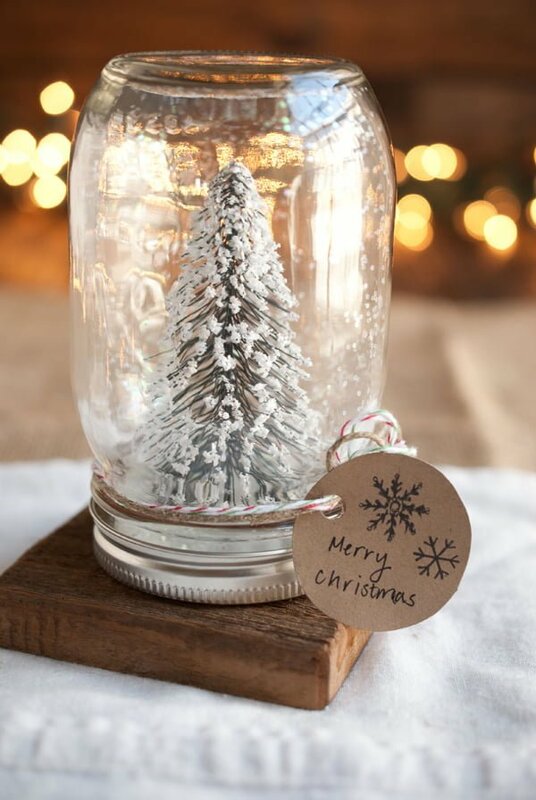 What a better way to start the holidays, than with this precious DIY snow globe idea? Mason jars are more than storage items and serve as great decorative elements as well. 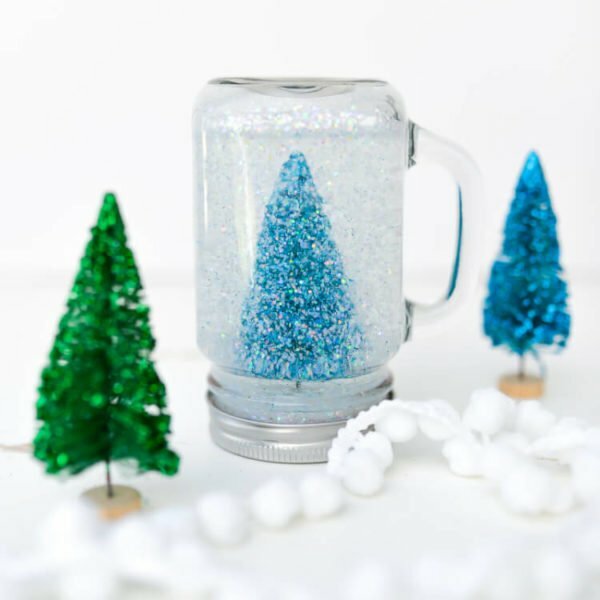 This idea focuses on several supplies you need, including a jar, artificial snowflakes, a glittery Christmas tree toy, and some extra glitter along with a mix of glycerine and water. Once you create the gel inside your jar, glue your tree onto the lid. After securing everything, add the glitter to your jar next. Bring the jar and lid together, and with a flip of a hand, you just completed a fabulous DIY snow globe!